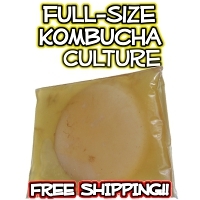 We’ve been brewing Kombucha and teaching people how to make it for over a decade. In all that time, we’ve learned a few things about how to keep Kombucha warm through the Fall, Winter and Spring months. And it is still one of the most common problems brewers face, often without knowing that cold temperatures are causing their brewing issue! 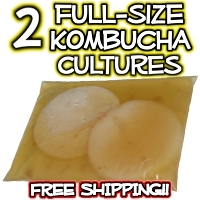 All through the year but especially during the coldest months, emails pour in with photos attached, from people without Kombucha heating mats that are desperate for answers about weak SCOBY growth, weak flavor, or sometimes the dreaded mold. The Dimmer System with efficient, sleek black coating, Velcro strap and included thermometer strip. Yes mold, that nemesis of home fermentation, can definitely show up if the brew is too cold. (Click here to see pictures of mold versus yeast or healthy SCOBY growth) But mold is not the only problem. 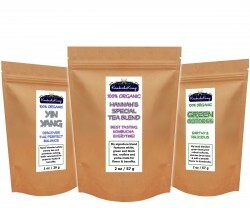 Yeast can dominate a colder Kombucha brew, causing the flavor or smell to be musty, funky or just strange. Even if it’s not ruined by an overrun of yeast or mold, a cold brew is usually lacking the depth and complexity of flavor, as the bacteria have difficulty producing the same range of acids that contribute to both taste and benefits. As long as no mold forms, a brew is always safe to consume if desired, but most people prefer Kombucha made at the right temperature, which is why all the commercial Kombucha brewing companies heat their brewing environments for best results. Rather than heat the entire room like they do, it makes sense for homebrewers to heat just the brewing vessel. And this is perhaps the most common question (other than “is this mold?” lol) that we get: How to keep Kombucha warm without heating the whole house? Many years ago, we had only unsatisfying answers. “A seedling mat?” “An old sweater?” “Put it next to the refrigerator?” Not particularly comforting to the new kombucha brewer. 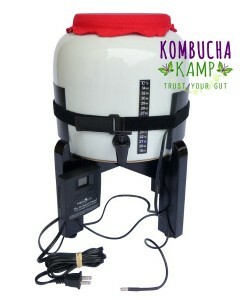 Have you tried using a seedling mat to heat your Kombucha? They barely put out any heat and waste 50% of the energy they use, the wires are not safe with glass or porcelain and they work best from the bottom, a big no-no with Kombucha, JUN or Kefir. And personal heating pads? 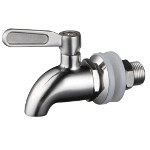 They shut off automatically, are awkward to wrap around a vessel and lose most of their heat out the back of the unit. Some people resort to using an electric lights to heat a brew, which is a problem because light is antibacterial, especially the bright, close kind required to raise temperatures. A little incidental light in the pantry is not a problem, but sticking it in the oven with the light on (which may also rust the oven!) or wrapping it in Christmas lights are more no-no’s here at KKamp. We love our bacteria and want to protect them! We are Bacteria Powered! All heaters have the same material underneath and produce the same amount of heat. 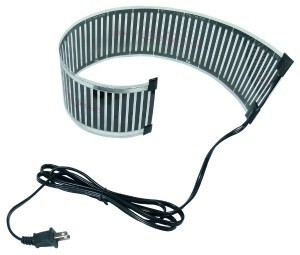 The Essential Heat Strip (pictured) is controlled manually and comes with the bare material exposed. We wanted to know how to keep Kombucha warm safely, efficiently, with less effort and even a little style. There were no answers readily available. So to solve the problem for ourselves and other homebrewers, in 2011 we came out with the very first models of our custom Kombucha heating mats, the Essential Heat Strip and Year Round Heating System w/ Dimmer, heaters that used highly efficient technology to deliver heat directly to the sides of the vessel where it can do the most good. Both have been very popular and since then, we’ve evolved the units several times. We’ve even added our dream heater, The Ferment Friend Heater w/ Thermostat, to the line, giving you three options to choose from. All three standard heater models put out the same power and therefore the same amount of heat. Where they differ is in how much control we have over the heat and the style and finishing touches of each unit. The Essential Heat Strip is our most basic of the Kombucha heating mats, which shows off the exposed heating material offers manual control. This means that if having the heater attached directly to the vessel provides too much heat, we can manually remove it and stand it around the sides of the brewing vessel to create a “forcefield” of heat. As the temperature changes, we then move it closer or further away. 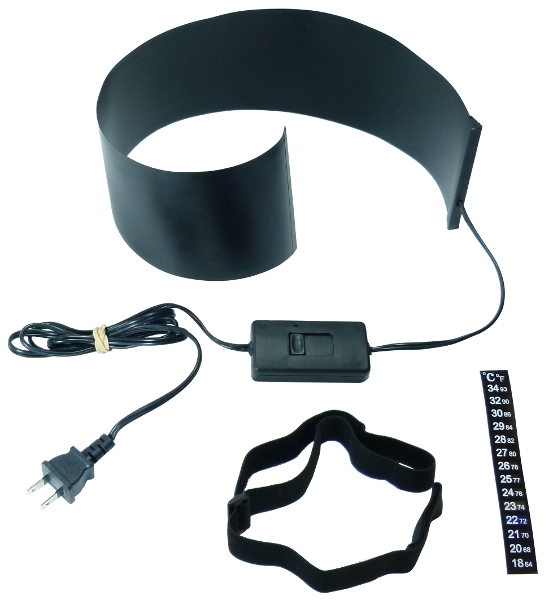 The Year Round Heating System with Dimmer has a black covering for style and insulation, a velcro strap for attaching to the vessel, and of course a slider dimmer that allows for setting the power level needed to reach your target temperature. Once stabilized, the temperature holds until the conditions change. 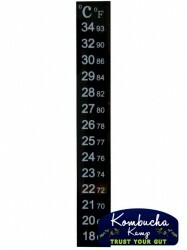 This means that often we can leave the setting alone for days or weeks at a time with occasional check-ins to the thermometer strip, then adjusted slightly as needed. What makes The Ferment Friend Heater with Thermostat so special is how we can just set the temperature, place the probe on the outside of the vessel not in contact with the heat mat, and it does all the work for us, keeping the brew within a few degrees of optimum automatically. It’s the easiest of all the Kombucha heating mats to use. We heard from so many clients over the years who wanted this type of “set-it and forget-it” option, and it was a challenge to finally bring all the pieces together at a quality level and price we could feel good about, so we are very proud and excited to offer this heater, and the response has been amazing. We love it too! The Ferment Friend installed on a Modern Porcelain Continuous Brewer from KKamp. The probe will be placed between the Velcro strap and the vessel, but not in contact with the heat mat. Of course they all have a Full One Year Warranty and include Free Shipping to the USA along with one free thermometer strip to attach to the vessel for monitoring (you can add more strips if you have more than one vessel). We use these heaters not just for Kombucha but for our JUN, water kefir and milk kefir grains as well, depending on how cold it is. The ideal scenario would be a heater for each ferment, but if you have a lot of them, that may not be possible. Multiple small jars or a few gallon jars can each be wrapped around the heat strips we offer. 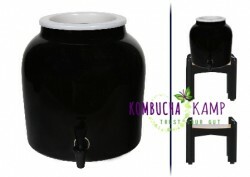 This makes it possible to have a whole slew of fermented veggies going with just one or two Kombucha heating mats. Another option is that each ferment has its preferred temperature range, so keeping those in mind, you may be able to rotate the mats. For example, heating Kombucha is most critical during the first 7 days of a 1 gallon Batch Brew or the first 10-21 days of a 2.5 gallon Continuous Brew. 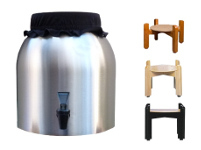 If you brew a longer Batch Brew or are on a break between batches with the Continuous Brew, you may be able to “steal” the heater from your Kombucha to help with other ferments, especially those that require only a short turnaround like Water Kefir or Milk Kefir. Using Kombucha heating mats to add a little warmth to your kefir brews or even something like sauerkraut, homemade fermented salsas, a ginger bug or dilly beans, just to name a few, can shorten fermentation time and produce foods with more bite and flavor. 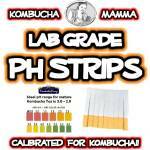 Just remember that anytime you add sweet tea to a Kombucha (or JUN) CB Set-Up, the Kombucha Heating Mats should be re-attached and set to as close to 80°F (27°C) as possible (75°F [24°C] for JUN). This guarantees the yeast and bacteria a happy environment to gobble up the nutrients in the sweet tea and create their symbiosis for ideal results. Having a couple of Kombucha heating mats for your ferments may add flexibility, then as you expand, you can add a new mat to handle additional duties. 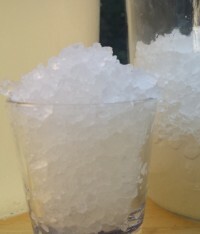 And if you plan on making homemade yogurt, the Ferment Friend can be set as high as 110°F (43°C)! Of course we’re not saying it’s impossible to make Kombucha or other ferments outside this range, but the flavor and results are simply vastly superior when done right. Just like quality ingredients, good sanitation, strong starters, and enough time, proper temperature has a big impact on the final product. We find ourselves eating much more fermented food when it tastes the best, even though we know we should be eating more when the batch wasn’t as good. It’s human nature! So if you need to figure out how to keep Kombucha warm during the brewing process, look no further, these heat mats can make that difference. Another way we find the mats very useful during the cold months is for improving the carbonation of the second ferment right before drinking. We keep our second ferment bottles in a cool closet, which works very well most of the year as it allows us to store it for longer while maintaining the right flavor. We usually have very good carbonation (not every bottle is the same) by the time we are ready to drink it. But in the winter, although the flavor is good, sometimes bubbles are hard to come by in that cold closet. Assembled in USA and all components made in the USA (except dimmer/power cord) which means your friends and neighbors have a job! ****SPECIAL NOTE: We also have the Brand New PRO Line Kombucha Heating Mats NOW AVAILABLE in either the Year Round Heater with Dimmer or the Ferment Friend with Thermostat! These special models have a larger heating mat, 7″ x 27″, which produces 2.5x the power and heat of the regular heaters. 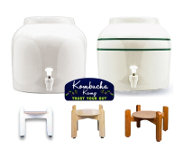 That increased surface area is perfect for those wondering how to keep Kombucha warm in larger vessels, such as a 5 Gallon Toasted Oak Barrel, or multiple smaller vessels. We developed these Kombucha heating mats in response to client demand and they are excellent at reducing fermentation time required for a batch to complete. The larger heaters also help those with VERY COLD environments, below 60°F (16°C), where the standard model heaters have more difficulty maintaining the higher ranges. These PRO Line Kombucha Heating Mats have been tested in the basements of Northern Canada to provide a powerful warming boost to your various brews. Learn more or order the PRO Line Kombucha Heating Mats by visiting the above Dimmer System or Thermostat System links and selecting it from the options drop down menu. This video shows our original versions of the heating mats, as you can see from the product pitctures, we have been through a few evolutions! But this video does still show the basic usage and some tricks.